If you really know me then you know I love this movie! I feel like I could be Joan Wilder and this movie is a total guide to life. The decorations at the shower were fabulous and went great with the theme. We even had an alligator! Besides the great decorations we had the movie playing in the background incase anyone who was at the party hadn't seen it. 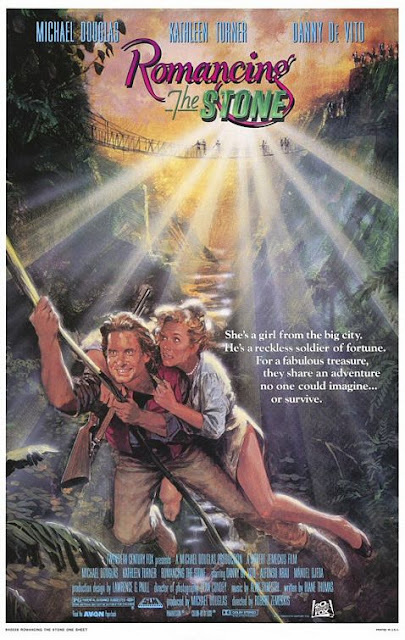 Seriously, if you've never seen Romancing the Stone go buy it right now! The party was catered by Chipotle which I love and it fitted the theme! Once we were done eating, I got to open up gifts. This awesome cake stand that I had been wanting for awhile came from my mom. An aunt of my fiancé found out how much I love Christmas and got us this really cute engagement ring ornament to go on our tree. The day after the party that ornament went directly on to the tree! The only thing missing was all of my east coast friends and my mom! I was really wishing they could be there but maybe we will do something all together during our wedding weekend? Maybe! I have to say this party wouldn't have come together if it wasn't for my fabulous fiancé. He did a lot of the planning, decorating and organizing! Love you! What a cool idea for the party! I haven't watched this yet, but it's on my list of movies to watch! So fun!! Hope you had a wonderful time!! What an adorable shower theme! I would never have thought of it. Awesome theme and loved the croc head with the crystal in it.